Critsuccess Stainless Steel d20 Spinner Dice Ring - Moar Stuff - You don't need it but you know you want it. This black Stainless Steel d20 Spinner Dice Ring from Critsuccess is a pretty unique and cool way to make an attack roll or saving throw. It’s also about the only fidget spinner type toy out there that also has a practical use…. for gamers anyway. The ring has an inner, free-spinning ring with indicators for 1 through 20. A pair of triangles indicate the result of the spin/roll. It’s great for a fidget toy between games or as your primary or backup d20 on game night. It’s available in multiple sizes and colors but, be careful when ordering these rings cannot be re-sized. 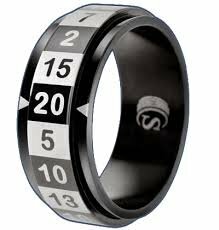 There are even different spinner ring values such as a d6 ring and the life counter ring (which you can use to keep track of your HP). Nothing slows down a game like dice-wrangling so, personally, I use mine as a backup dice for when the regular d20 goes rolling off the table and behind the fridge. That way the game keeps going and I can fish out my d20 when the thief is trying to figure out who he can sneak attack. If you still need regular dice, don’t forget about the Dice Bag of Holding. A bag of 140 dice can keep you rolling for a long time. Dimensions: 0.9 x 0.3 x 0.1 inches. Different dice rings available such as a d6, alignment spinner, d100, and hit point counter.